LANSING, Mich. — Sen. Jim Stamas on Friday said he is disappointed and frustrated that Attorney General Dana Nessel is unwilling or unable to follow the Michigan Constitution or law. Stamas is chairman of the Senate Appropriations Committee and the General Government subcommittee. LANSING, Mich. — Sen. Jim Stamas on Friday congratulated area schools awarded grants this week from the state’s 2019 Competitive School Safety Grant Program. The Michigan State Police (MSP) in October awarded $25 million in grants to 188 schools, school districts and regional education agencies throughout the state — including schools in Alcona, Alpena, Coleman, Gaylord, Gladwin, Midland, Mio and Sanford. 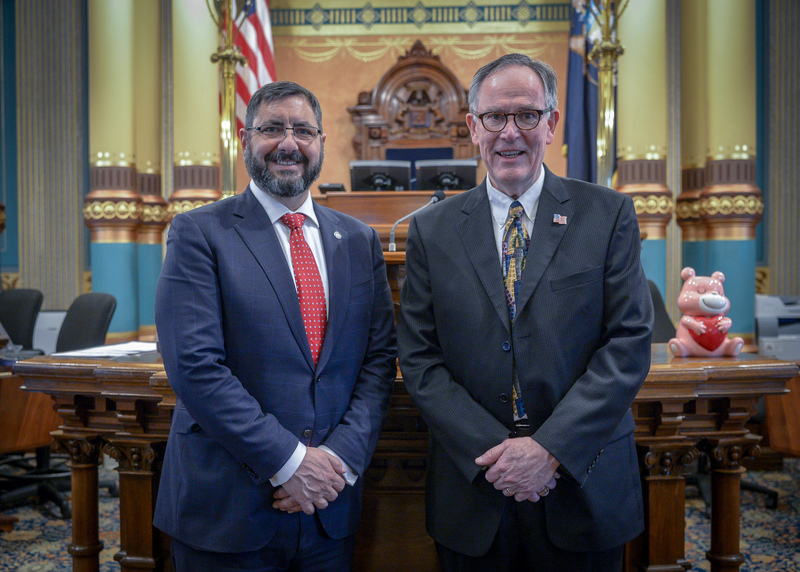 LANSING, Mich. — Sen. Jim Stamas on Wednesday said the announcement by the Michigan Catastrophic Claims Association (MCCA) of a nearly 15 percent increase in its assessment illustrated the need to reduce the cost of car insurance in Michigan. The MCCA announced on Wednesday that its assessment on auto insurance companies will increase by $28 on July 1 from $192 to $220. The increase will ultimately be passed on to drivers in the form of higher rates. Residents can tell their stories about what lower auto insurance rates would mean to their family at www.IfMiRatesWereLower.com. “I encourage drivers to submit their stories as we continue to work on achieving much-needed relief through comprehensive reform that adds flexibility, combats fraud and reduces costs,” Stamas said. LANSING, Mich. — Sen. Jim Stamas is alerting Michigan homeowners about inaccurate information being shared online about the principal residence exemption. 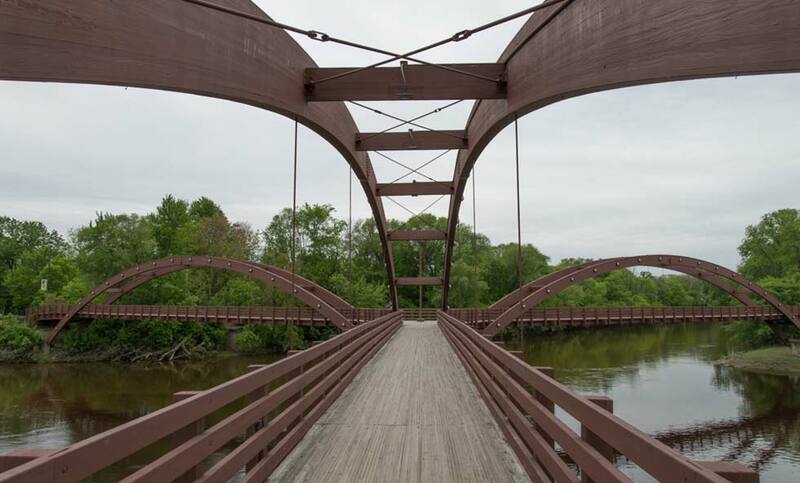 According to the Michigan Department of Treasury, state officials and local assessors are experiencing a surge in inquiries from residents who are trying to verify the misinformation or submit unneeded paperwork. A principal residence exemption (PRE) exempts a residence from the tax levied by a local school district for school operating purposes up to 18 mills. To qualify for a PRE, a person must be a Michigan resident who owns and occupies the property as a principal residence. For more information about property taxes, residents can visit www.michigan.gov/propertytax. 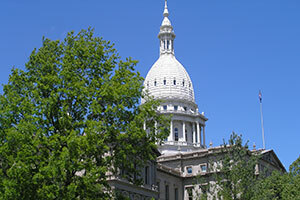 Residents can also contact Stamas’ office toll-free at 1-855-347-8036 or via email at SenJStamas@senate.michigan.gov. 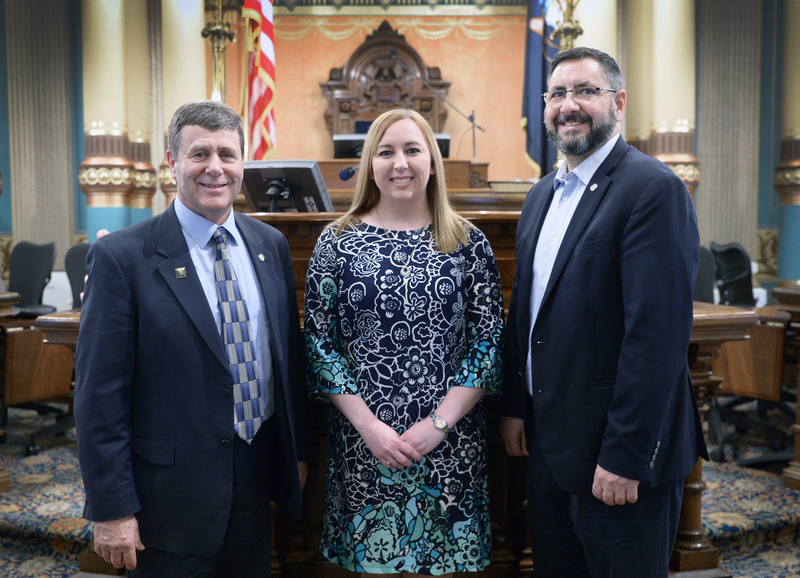 LANSING, Mich. — Sen. Jim Stamas, R-Midland, and Sen. Kevin Daley, R-Lum, welcomed Standish Area Chamber of Commerce President Tara Binder to the Michigan Capitol on Thursday. She was a guest of Stamas and spent the day learning more about state government. Binder lives in Pinconning, is a graduate of Unionville-Sebewaing High School and is the bank manager at Independent Bank’s Standish office. Last year, she was honored by Independent Bank with its first-ever Volunteer of the Year Award. 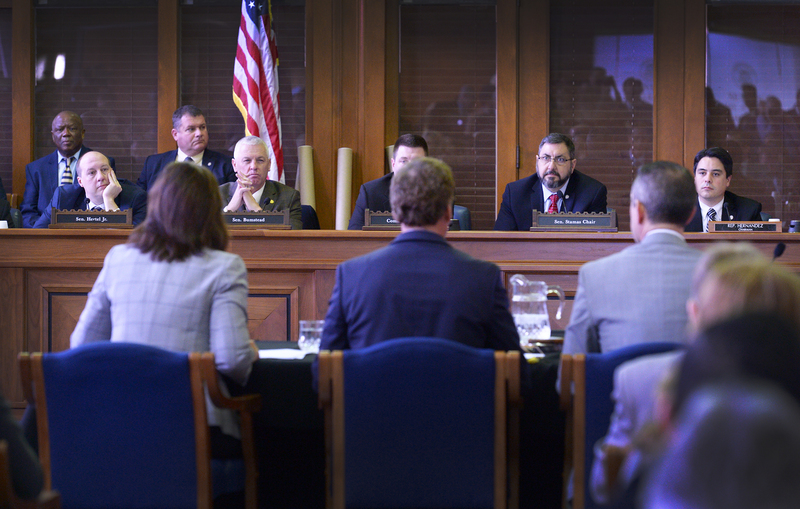 LANSING, Mich. — Senate Appropriations Committee Chairman Jim Stamas, R-Midland, listens as Gov. Gretchen Whitmer (left) presents her fiscal year 2020 state budget recommendation during a joint meeting of the Senate and House appropriations committees on Tuesday. The governor’s recommendation starts the process of enacting a state budget for the next fiscal year. Editor’s note: The above photograph is available by clicking on the image or by visiting www.SenatorJimStamas.com/Photowire. “This is the beginning of the budget process, and I am committed to working with our House colleagues and the governor to pass a responsible budget that helps build a better Michigan for families, workers and job creators. “With smart budgeting, we can continue to fix our roads and infrastructure, support our schools and our students, keep our state on solid financial footing, and promote efficient and effective government. “We must continue to invest in Michigan’s future. Over the last eight years, we have increased state funding for schools by $2.2 billion, and we’ve put $2.8 billion in new investment into our roads since 2017 — but more needs to be done. LANSING, Mich. — Sen. Jim Stamas is reminding residents that the state’s annual Winter Free Fishing Weekend is Saturday and Sunday, Feb. 16-17. 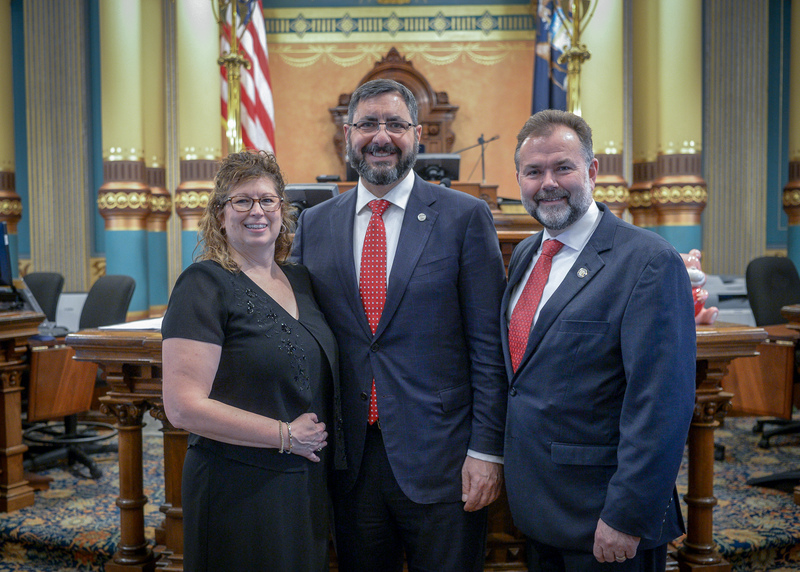 LANSING, Mich. — Sen. Jim Stamas, R-Midland, welcomed Bob Young of Presque Isle County and Ken and Brenda Borton of Otsego County to the Michigan Capitol as his guests for Gov. Gretchen Whitmer’s 2019 State of the State address on Tuesday night. Editor’s note: The above photographs of Stamas with his guests are available by clicking on the images or by visiting www.SenatorJimStamas.com/Photowire. Top photo caption: Sen. Jim Stamas, R-Midland, welcomes Ken and Brenda Borton of Otsego County to the Michigan Capitol as his guests for Gov. Gretchen Whitmer’s 2019 State of the State address on Tuesday night. Ken Borton is chairman of the Otsego County Board of Commissioners and board president of the Michigan Association of Counties. Bottom photo caption: Sen. Jim Stamas, R-Midland, welcomes Bob Young of Presque Isle County to the Michigan Capitol as his guest for Gov. Gretchen Whitmer’s 2019 State of the State address on Tuesday night. Young is the owner of Young Appliance in Alpena.